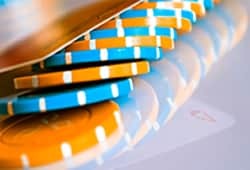 You may have heard somewhere that you should raise to punish draws, or to deny your opponents correct odds for drawing. Let me first make my point quickly: It's good to bet to get more money in when you're ahead, and it's good to bet enough so that people will make a mistake if they call with a draw - but you probably shouldn't /raise/ your opponent's bet even if you strongly suspect that he's on a draw. In other words: Bet to punish draws, but don't raise to punish draws. Half the time, we're 80% to win. Half the time, we're only a little bit more than 10% to win. On average, he has the edge. This alone means that we shouldn't raise. But what if the proportion was that he's semibluffing 2/3rds of the time? Two-thirds of the time, we're 80% to win. One-third of the time, we're only a little bit more than 10% to win. Surely now we have the edge? Yes, we do - but only up to the second before we make the raise! As soon as we raise, our opponent has the edge again, but one-third of the time he's might re-raise with a hand that crushes ours. The fact that through raising we're opening up the betting for him again is what makes all the difference. We really can't fight the semibluff with aggression. In fact, there isn't really a defense against the semibluff other than to call and re-evaluate the river. In a big pot, occasionally making a blocking bet with a big draw can, in other words, be great if you also sometimes do the same thing with big hands (sets etc). If your opponent raises you when you have a draw, you're in trouble - but the times he does it when you have the big hand, he just cost himself a stack. Note that this doesn't hold true when stacks are shorter and your initial raise will put either of you all-in. The danger lies in being re-raised, not in raising to begin with. If you take away his ability to re-raise you, you just need the usual 50% chance to win to make money. The conclusion then: If you never semibluff or lead out with draws, consider trying it to get a feel for what it can do. Occasionally also do it with big hands. And if your opponent leads into you on a drawy board when your hand is vulnerable and he either has a big hand or just a draw, you often shouldn't raise.